For some time, I have endeavored to locate copies of original part drawings for the M1 Carbine. I was hopeful that these drawings would contain the revision history of drawing changes so that I could determine the exact date, disposition and reason for each change. However, it looks like such details may be lost. Some of the drawings I found have had the revision data redacted. Other drawings just say "revised and redrawn" without describing the change. However, these drawings are useful in answering some of the questions that come up on this and other forums. There are two main sources for detailed drawing information. One is Jerry Kuhnhausen's, "The U.S. .30 Caliber Carbines Shop Manual", available on Amazon. This 224-page book contains elements of the Ordnance drawings for the M1 Carbine but these drawings are not really complete. They are "new" drawings made by the book publisher containing partial details of the original Ordnance drawings. They do not contain all of the necessary dimensions from the original Ordnance drawings. I was unable to answer many of the common questions that have been asked on this and other forums using only this resource. A second and superior source of detailed drawings is Eric Nicolaus' book "Carbine, Cal. .30 M1: Diagrams & Pictures" available for purchase on his web site. This book contains the latest complete detailed drawings of all the carbine parts along with related assembly drawings. These are Ordnance drawings obtained by the author from the National Archives and cleaned up to make them legible in his book. The revision blocks are intact on these drawings but there is no way to link them to any available description of the change itself. It's possible that the details of these revision changes can be found in the National Archives but that would require investigations that I'm not prepared to undertake. 1) What is the height of the front sight blade on an unfiled sight? This comes up when issues occur with POI regarding switching from flip sight to adjustable sight. .785” minimum from the centerline of bore or 1.115” minimum from the bottom of sight (Type 1 and 2 only). 2) Is the receiver dovetail tapered from left to right? We are always told to install the rear sight from right to left and to remove it from left to right. No, the dovetail is not tapered. The primary reason to remove the sight from left to right is to avoid possible interference with windage knob. However, it should be noted that installing or removing the sight from the left side may cause damage if the dovetail has suffered deformation resulting from the previous assembly of a tight-fitting sight from the right side as instructed in the Ordnance drawing and subsequent staking instructed in the TM’s and not from a pre-existing “taper”. 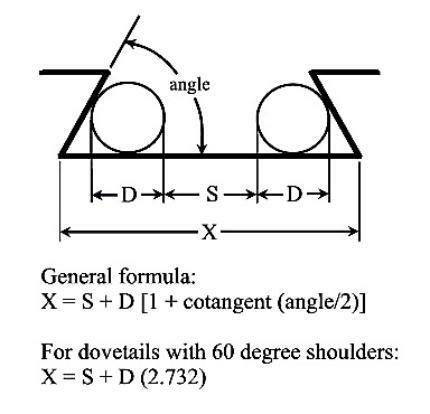 Note: Subsequent investigation has found a reference to the dovetail being “tapered” in the 1947 issue of TM9-1276 page 61, para. 46b . Also noted was a reference to the “S” stamped on the left ear as meaning the “small” side of the sight. These references were not found in the later 1953 issue of TM9-1276 (link below). As already suggested, the rear sight should be removed from left to right to prevent damage to the sight or receiver dovetail. 3) What is the radius of the recoil plate shoulder in the stock? .25” Radius. Robert W. Irwin stocks frequently have a distinctive gap resulting from a smaller .125 radius. Reason unknown. 4) What is the clearance between the stock and inertia block of the operating slide? FTF’s are sometimes caused by inertia block rubbing inside of the stock. .055” min, .085” max or .0275” to .0425” per side when centered. 6) What is the barrel diameter? Often a question when fitting a new front sight. .600” DIA -.005 at barrel band, .5800” DIA -.0025 at the front sight. 10) What is the width of the tab on the recoil plate? Loose fit affects accuracy. .47” -.02 (Wartime issue only. Later post-war RIA recoil plate measures .438). 14) What is the carbine barrel made of? Can a cracked gas cylinder be successfully welded? Steel, Mil S-11595 Chrome-Moly-Vanadium or 4150 re-sulpherized. This may have applied to later barrels only. It was reported that early barrels were made of WD 1350 re-sulpherized steel and should not be welded. 15) I need to retap damaged threads on the gas cylinder. Does anyone know the diameter and pitch of the threads? The original Ordnance specification is "1/2-32 NS-3". However, this may be an obsolete thread standard. The modern equivalent is a .500"-32 TPI plug tap per Kuhnhausen’s Shop Manual. 2) Is the receiver dovetail tapered from left to right? We are always told to install the rear sight from right to left and to remove it from left to right. No, the dovetail is not tapered. The primary reason to remove the sight from left to right is to avoid possible interference with windage knob. However, it should be noted that installing or removing the sight from the left side may cause damage if the dovetail has suffered deformation resulting from the previous assembly of a tight fitting sight from the right side as instructed in the Ordnance drawing and subsequent staking instructed in the TM’s and not from a pre-existing “taper”. I believe this is incorrect. If you examine the drawings carefully, you will find that the left side of the receiver dovetail is a bit narrower (0.006" IIRC) than the right side. It is believed that this angle was given as a tolerance, not a required dimension. It is meant to require that the sides would be parallel within half a degree and square with the center-line of the receiver within a quarter of a degree. The side view also below shows the angle of the dovetail as being 30 degrees with a tolerance of 15 minutes. Again, the 15 minutes is a tolerance not a required dimension. The process used to machine the carbine dovetail (as described in War Baby!, pg. 72, operation #47) does not lend itself to achieving such an angle without multiple setup changes and multiple operations, which would be difficult and costly. It is described as a single operation, at least by Winchester. Finally, I have searched for any description of a dovetail machining process that would intentionally result in a taper and, so far, no luck. Any information that you might have on the topic would be greatly appreciated. Well, you could be right about that angular spec and I stand corrected. I'm not a machinist and interpretted it as something other than a tolerance. I don't have any of my reference materials with me so I can't "research" this further from here. What does the S mean on the left side of the leaf sights, with no windage knobs to get in the way? What does Fulton Armory do? Their commercial receivers are "supposed to be" to USGI spec and they use real machinists. Does their receiver dovetail have a manufactured "taper"??? While I'm quite sure they won't share their drawings and CAD models, I feel fairly confident that they could and would tell you whether their sight dovetail is tapered, or not. @Blackfish, I don't have any drawings of the flip sight. So I have no authoritative documentation to support this reply. However I believe I am correct in saying that the "S" on the flip sight base stands for "Sinister" which is Latin for "on the left side" ("Dexter" is for "on the right side"). In the past, being left handed was considered evil in many cultures, thus the negative present day definition. It's real easy to get a flip sight on backwards. We see it all the time in supposedly "original" carbines. Some say the aperture was put in the base backwards, some say that the whole thing is on backwards. It varies. As you know, there's a discussion going on right now about this very topic in the General Discussion forum.